Reflective striping added to the original RadioTech Custom Made XTS 3000/5000 Plain Reflective Radio Case gives you high visibility in low light and night time conditions. Specially developed to repel moisture and resist scuffing, the hardy zig zag nylon stitching, rust resistant rivets and “D” rings give this case unmistakable quality. 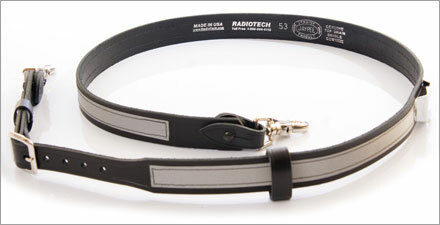 The RadioTech Original Communicator Style Radio Strap with reflective striping gives you high visibility in low- light and nighttime conditions. It is based on the original FDNY design, in service by FDNY for over 30 years. The 3M silver reflective tape material (which meets or exceeds NFPA – 1971-2000 standards) is securely glued and then stitched with high quality nylon chain stitching to assure maximum adhesion to the RadioTech Anti-Sway Stabilizer.